The St. Mary’s Church of Kandanad is believed to be about 600 years old. Since its inception, the church was renovated, remodeled and rebuilt on several occasions and the edifice in its present magnificent form appears to have been completed in AD 1910. Various stages of its construction are recorded at relevant portions in the mammoth structure. For instance, on the timber wall along the Madbho, it is inscribed: “the wood work completed in 1909, the gilt work in 1910 and the Holy Qurbono conducted on 9th Medam 1910”. Similarly the massive pillars erected at the outer corridor are etched with the year “1931”. The village Kandanad lay along the border of erstwhile Travancore and Cochin. 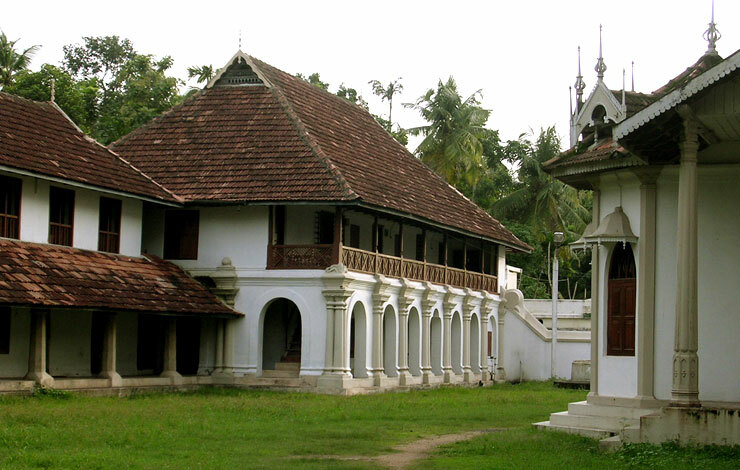 Though it belonged to Travancore, its culture is markedly Kochiite. This may be due to the village’s close proximity to Kochin royalty (Thripunithara, the former seat of Kochin kings) as also its immediate urban contact comes from the main city of Cochin state namely, Ernakulam, hardly fifteen kilometers north. The people are mostly Christian farmers, small and big. Indeed, the economic viability of agriculture has dwindled and its adverse impact has prompted the community to seek other profitable enterprises and the educated have gone after greener pastures, the Gulf-boom assisting in no mean measure and the village has prospered with modern amenities and has acquired almost semi-urban status now. The village’s day invariably begins with loud knoll of the huge bell at St.Mary’s Church and villagers are infallibly chimed into wakefulness every morning. The church is situated 1.5 km. east of Udayamperoor where the historic ‘Synod of Diamper’ was held on 10th June 1599 and 3 km. west of the renowned MarThoman Jacobite Syrian Church at Mulanthuruthy. 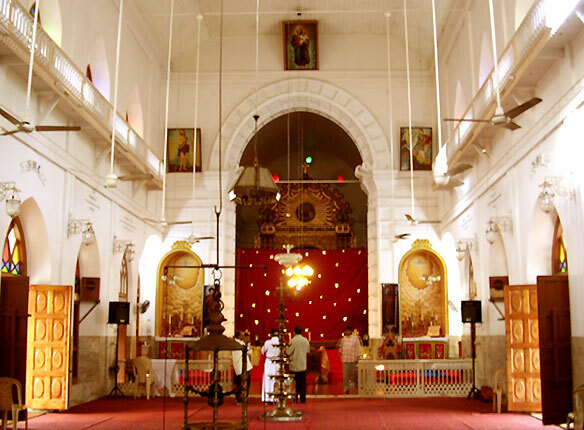 St.Mary’s Church has over the years attained the pride of place as the cathedral church of Kandanad diocese. It is recorded in the visitor’s dairy that Claudius Buchanan, a member of the Anglican Church who was keen to have a viable tie-up with the Syrian Church in Malabar had visited the church in 1806. 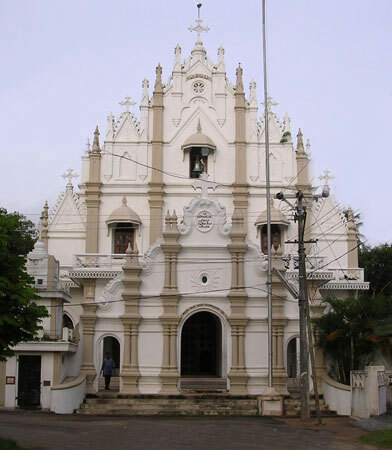 The western façade of the church has striking similarity to other ancient churches such as Mulunthuruthy, Karingachira, Piravom, Angamali, Manarcad etc. Just below the cross on the face of the church can be seen the following inscription in Syriac: “Come, Enter those who are blessed by my heavenly father – our Lord’s year 1400”. So it can be safely assumed that the original church was built much earlier than the present one. Behind the altar on the wall in the sanctum sanctorum, biblical quotations are inscribed on wooden planks. The left plank carries: “My flesh the real food and my blood the real drink’ (John 6:55) and on the right plank, the third verse of chapter 9 from Hebrews, that speaks of the Holy Place of the Tabernacle, is inscribed. The ‘Koodesh Kudsheen’ is a splendid piece of Persian Architectural splendour. Just below the Madbho are entombed on either sides of the steps, the mortal remains of Mor Thoma IV and Maphriyono Mor Baselios Shakralla Bava. The tomb at the right carries the inscription on the marble head-stone. 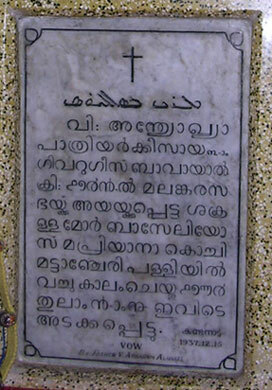 “MorThoma Metropolitan who hails from Pakalomattom family entered eternal rest on 13th Meenam 1728 AD.” In front of this tomb is placed the sacred relics of Mor Geevarghese Sahado (St.George). The tomb at left carries the inscription on its marble plaque “Shakralla Baselios Maphriyono who was deputed by His Holiness the Patriarch of Antioch Moran Ignatius Geevarghese Bava in 1749; died at Mattancherry and entombed here on the 9th Thulam, 1764”. His hallowed memory is celebrated on 21st and 22nd October every year with great worshipful fervour. 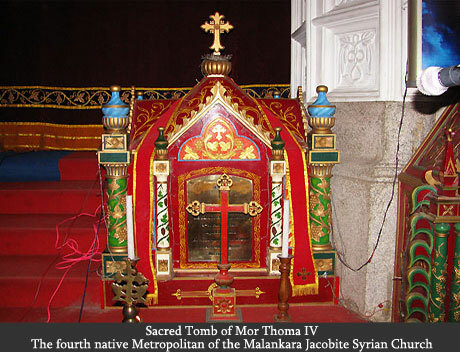 The strength, power, glory, growth and the very existence of Malankara Syrian Church is unequivocally related to the holy fathers of yore who against all odds and impediments reached here and guided us from time to time in order to uphold Petrine Succession with the stamp of authentic apostolic entity. The faith, priesthood, liturgy, rites, rituals and practices, hierarchic protocols, the appellations and vestments – everything has been of the Antiochean Church. The sacrifices made on our behalf by the Syrian holy fathers are legendary. One of those illustrious fathers who came down to lead us during an acutely turbulent time is late lamented Shakralla Mor Baselios. It is more than 200 years since the Holy Father attained his eternal rest. Yet his memory is etched in golden letters in the history of Malankara Church and those who pray at his venerated tomb at Kandanad continue to receive heavenly blessings in abundance. It was Mor Thoma IV who had sent messages to Antioch requesting the Holy Throne to depute a Maphryono to Malankara when the church was passing through a stormy and rudderless phase of its existence. In those days communication was extremely difficult and letters got lost in transit or delivered at wrong places. So the letter dated 25 Kanni, 1720 by Mor Thoma IV did not reach the holy throne. Consequently, the earnest desire of Mor Thoma IV who keenly awaited the arrival of the Maphryono from Antioch could not be fulfilled and Mor Thoma breathed his last before the delegate from Antioch reached the shores of Malankara. 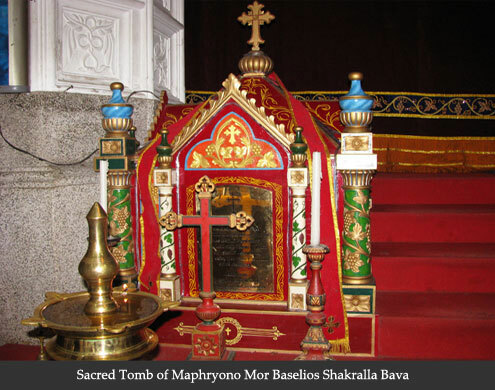 However, it is strikingly significant that Shakralla Mor Baselios is laid to rest beside the tomb of Mor Thoma IV in St.Mary’s Church, Kandanad. Cochin and the travel plans had to be rescheduled more than once. Overcoming all difficulties and excruciatingly painful obstacles the Maphrian and others with their courage, dedication and sense of purpose reached Kandanad on the 4th of Karkidagom, 1754. But those in Malankara failed to organise a proper reception befittingly to the Maphryono and party from Antioch; also failed in another sterling duty as well: they did not deem it worthwhile recording the Maphryono's services and events in his life here. So what we have regarding his sojourn here is sketchy and woefully inadequate. The Holy Father stayed in Kayamkulam Kadeessa Church for a long period. His blessed memory is celebrated in this church every year. 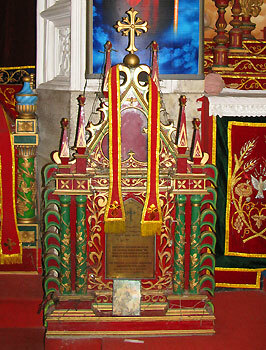 He was instrumental in establishing a church at Mattanchery. The major duration of his stay in Malankara was spent in Kandanad and during this period he strived hard to annex huge areas of fertile lands which augmented the financial status of the parish greatly. The holy father completed his divine mission on this earth and left for the heavenly abode while at Mattancherry and was laid to rest in this church on 9th Thulam, 1764 (Syro-Malayalam calendar). May his venerated memory be blessing to all of us. 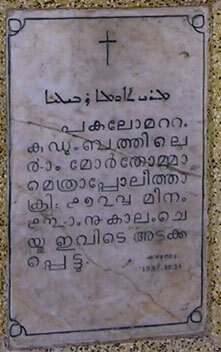 In 1998 the old structure of the Kandanad Marth Mariam Church was renovated and consecrated. The contributions of the parishioners, were generous and voluntary and the renovation work was excellently executed to the entire satisfaction of one and all. The ‘Thronos’ (altars) at either side of the main Madbho of this magnificent church are dedicated to St.John the Baptist (north) and St.George (south). H.G. Mathews Mor Ivanios, the present Metropolitan of Kandanad diocese of the Jacobite Syrian Church belongs to the Alungkal family of the Kandanad Marth Mariam Parish. Pulliyat Thukalan Pailo Avira, the former Lay Trustee (1935-'62) and Mr. Thambu George Thukalan the present Secretary of the Church, hails from this parish. Under the able leadership of the diocesan Metropolitan H.G. Mathews Mor Ivanios, a new centre named after Mor Baselios Shakralla Bava is under construction adjacent to the Old Marth Mariam Church. When completed, this centre will function as the diocesan headquarters of the Jacobite Syrian Church.